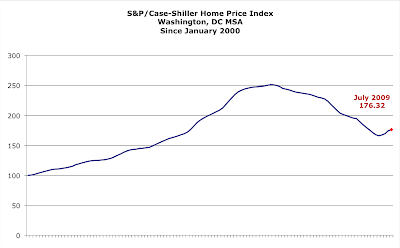 The S&P/Case-Shiller Home Price Indices report for July 2009 was released Tuesday. You could almost hear the champagne bottles popping all over the country, considering how the media reported it. The report show "although still negative, the annual rate of decline of the 10-City and 20-City Composites improved compared to last month’s reading." The report's chart shows that nationally, home prices are back to "the autumn of 2003" level. 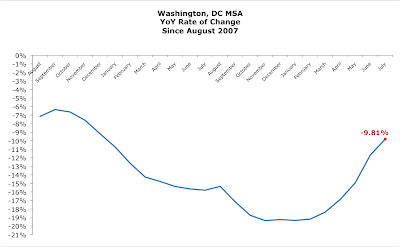 YoY, DC area prices are 9.81% lower. 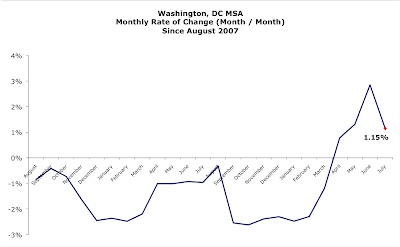 While prices continue to rise in the DC area, the price increase June/July was less than that of May/June. Amazing that less bad is something to celebrate.